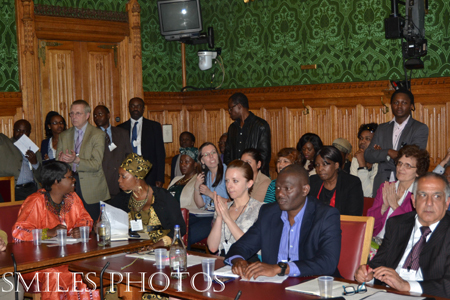 This is a great pleasure for our Nigerian delegation to be speaking in the British Parliament centering on the words of freedom. This year’s celebration of Africa Day is indeed a rare opportunity for myself and my Christian brother, Rev. Kato. We have been in government for about six years now. My Governor always says, "if you think peace is not important, try war." Our governor is doing a lot in terms of women and youth empowerment, peace initiatives, educational development, health, etc. We are happy that Africa is coming up. Because of the enlightenment they feel now through the technological development and social media, most of the people - not all - are developing. We are always on our feet to ensure that Africa, and particularly the country we come from, is out of darkness. That is why I, a Muslim brought up under a strict Islamic discipline, had the opportunity not just to preach peace and not just to be a government official but also to practice peace. My colleague here, Rev. Kato, who is a Christian pastor, has a very strong team and support from the governor of Bauchi State to ensure that all the things said about the north of Nigeria being in crisis, etc., are halted immediately. We got the impetus to do that through UPF. I want to particularly thank UPF-Nigeria for giving us the opportunity to go around the world and have the exposure to how people are making peace. We need to have peace to help Africa to come out of the dark ages. Investment will not flourish where there is no peace. Islam and Christianity will also not develop without peace. That is why my governor always says, ‘If you think peace is not important, try war." Whenever there is any peace conference he says to us, "Go there and learn." That is why it is important for us that we are here today to share all these experiences. We are very pleased to be associated with UPF especially on the principle of living for the sake of others beyond race religion or ethnicity. It is now or never that we need to have all hands on deck to help deal with our problems and help raise Africa out of wars and crises like what is happening in the Congo. Boko Haram has caused problems in northern Nigeria. It originated in Bauchi State, but it was crushed when it raised its ugly head. Bauchi state is now the most peaceful of the six northern states. We hosted a UK diplomat in Bauchi state to demonstrate our good policies. The governor has an open-door policy and has helped to make Bauchi a modern state. Our elder brother has indicated where we should do more. We need to take the message of development so that men women and children can all develop in what is the home of civilization. We are still growing, and it is our hope that the West can portray Africa in a good light and that investment and trade can develop. Usually these tensions come as a result of misinterpretation of the religious books, in this case the Qur'an. At times ignorance and poverty play a greater role. Whatever are the causes, they boil down to misunderstanding, and usually people tend to have a biased mind towards the speaker or the presenter. However, we keep talking to the people to help them realize the need for peace. You cannot fight for good, and once there is no peace, you cannot maintain goodness. So it’s really a big effort. However, we have that belief in us, and so we keep moving together. At the end of the day a few people understand what we are doing. It’s not easy to reorient a person in a day. It requires a lot of perseverance, persistence, and courage; and that is exactly what my brother Rev. Kato and I are doing or are trying to do. Our state, as I keep saying, is at the center of it all; however, either through the good work of our governor or through the prayers of good people, God is keeping the state relatively more peaceful than the other states in northeastern Nigeria. That gives us the impetus to continue forging ahead despite the shortcomings. I think that is basically what is keeping us going.